Do you long for a peaceful, connected, and joyful home… but instead find yourself exhausted and stressed by your children and responsibilities? Do you wish there was a way to help your child be confident, centered, and happy… but instead find yourself facing tantrums, anxiety and aggression? Do you dream of a family life that is warm, bonded, and loving… but instead find yourself refereeing sibling fights, peeling children off your leg and yelling before breakfast? Parenting is so much more than figuring out the logistics of keeping children healthy and safe (and getting them to school on time!). It is about developing and maintaining a relationship with this beautiful being who came into your life. The profound connection you form with your children, and the family you create, will be the guiding force of their lives. 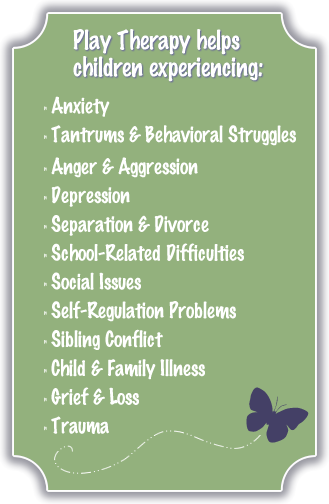 As a licensed professional counselor specializing in child and play therapy, I help families find connection, strength and balance. I believe that YOU are the expert on your children, but that sometimes you need support and guidance to fully understand their needs and guide them through their lives.